Construction of physical traffic calming measures was completed in the fall of 2018. Remaining works include implementation of pavement markings and remaining signage. It is anticipated all remaining implementation will be completed in Spring / Summer of 2019. Following implementation, monitoring and evaluation will be conducted and adjustments made as necessary. 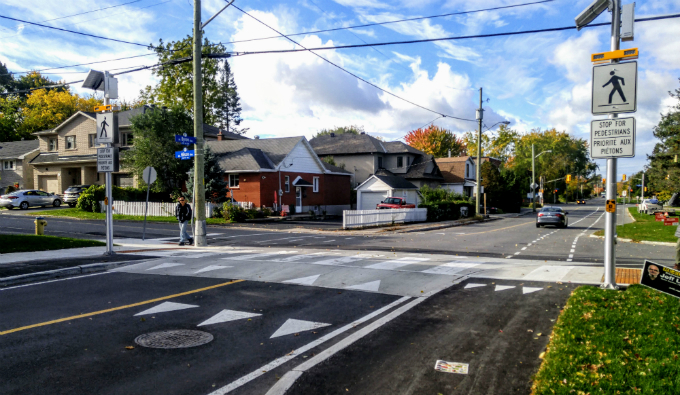 The planning study for this project was completed in 2017 and was submitted to the City of Ottawa Infrastructure Services queue for detailed design and construction. The project is currently in the detailed design phase and anticipated to be constructed in 2018. The City hosted a public meeting to discuss the Byron Avenue Traffic Calming project. Feedback received through the survey between March and May has been reviewed and a draft design prepared. Links to all materials presented are included below. A traffic calming plan for Byron Avenue was approved as part of a wider area study for the McKellar Park community initiated in 2005. The Byron traffic calming measures have now prioritized for implementation. However, given the higher policy emphasis on cycling and pedestrian needs, the approved plan was reviewed and updated in consultation with the public to ensure these users are considered and to address other localized concerns along the study corridor. This included consideration of a new type of cycling facility - advisory cycling lanes. Is the City installing advisory bicycle lanes on Byron Avenue? That has not been decided yet. Our primary objective is to slow traffic in order to meet previously approved traffic-calming objectives for Byron Avenue. Staff are considering a range of possibilities, not just advisory bicycle lanes. However, since advisory bicycle lanes have not been used in Ottawa before, staff are collecting public feedback on the concept through our online feedback questionnaire. What are advisory bicycle lanes? While similar to regular bicycle lanes (which are marked on pavement by solid white lines), advisory bicycle lanes are used on narrow, low-volume streets and are marked with dashed lines. These markings give cyclists riding space, but are also available to motorists if needed to pass oncoming traffic. This concept has been used in other cities, but not in Ottawa. For more information on advisory bicycle lanes, please visit ottawa.ca/advisorybikelanes. Why is the City considering advisory bicycle lanes on Byron Avenue given the high traffic volumes? We are not going to be considering the advisory bicycle lane concept in high traffic volume locations. For low volume locations, advisory bicycle lanes will be considered as one of a range of potential alternatives. The study corridor is nearly three kilometres long with different segments exhibiting unique characteristics. East of Golden Avenue, volumes are generally high and the context is not appropriate for advisory bicycle lanes. However, there are segments west of Golden Avenue that are considered potential candidate locations for advisory bicycle lanes. Staff will be collecting additional data, conducting site observations, considering experience from other cities, following technical guidance, and reviewing public commentary to help isolate which segments are appropriate. Where context is appropriate, advisory bicycle lanes will be included as an option. Is it really appropriate to be using advisory bicycle lanes as a traffic-calming measure? No. We will not be considering the use of advisory bicycle lanes exclusively to help slow traffic. The City will also be considering physical traffic-calming measures (e.g. speed humps, roadway narrowings, speed tables). At the moment, we are in the process of generating public comments regarding traffic-calming measures through our online feedback questionnaire which is open until May 25th, 2016. Will the City consider turn restrictions along Byron Avenue to help reduce traffic? No. Through the McKellar Park Area Traffic Management Study approved in 2012, recommendations called for traffic calming, but not turn restrictions. The City will not be introducing access restrictions as part of this project given that these items should be addressed through a wider area study (such as the study done for McKellar Park) given the potential neighbourhood-wide impacts. Will Byron Avenue be reconstructed as part of this project? No. The City will be implementing traffic calming, signage, and pavement marking features along the existing corridor without a full reconstruction of the road. To implement advisory lanes, do you simply add painted dashed lines on the side of the road or are there other features? There are two important considerations. First, advisory lanes are only appropriate on low-volume, low-speed street segments. As such, should volumes and speeds be higher than appropriate, changes (such as traffic calming) would be required to get speeds and volumes down to levels that would allow for proper operation of advisory lanes. Second, to mark the presence of advisory lanes, both painted dashed lines and supporting signage would be used. For more information on advisory lanes, please view the feedback questionnaire which contains a brief description, some drawings, and a link to a video of advisory lanes in operation. If advisory lanes are recommended for a section of Byron, what happens if they don't work as envisioned? If advisory lanes are recommended for Byron, they would be installed on a trial basis as a pilot project. Staff would then monitor operations to help complete a before and after evaluation. Where the design is not operating as it should, adjustments would be made to correct the issue. Should those adjustments fail to address the issues they were intended to correct, the advisory lanes would be removed. Why is the City considering cycling facilities on Byron Avenue when there is a path along the linear park next to it? While the path through the linear park on the north side of Byron (Tramway Park) may be appropriate for light recreational cycling, it has been highlighted as problematic for those cycling for commuting and other utility purposes. The primary reasons for this are that the pathway is non-linear, discontinuous, narrow, used primarily by pedestrians and dog walkers, and acts as a space for hosting various events such as the Farmers market. Staff have conducted site observations and concluded that the current pathway is not appropriate for non-recreational cycling. Doesn't the City already have advisory bicycle lanes on Fifth Avenue between O'Connor Street and Queen Elizabeth Drive? Yes and no. Advisory style markings have been used on Fifth Avenue between O'Connor Street and Queen Elizabeth Drive, however these are not considered true advisory bicycle lanes. The Fifth Avenue treatment provides two separate vehicular lanes divided by a yellow centreline. The potential concept for Byron would not use a yellow centreline and the width of the two-way centre lane would be less than what is traditionally used for two full vehicular lanes. The purpose of the Byron Avenue Traffic Calming Design Study was to determine a plan to improve conditions for all road users by introducing supportive design features to the existing roadway between Redwood Avenue and Island Park Drive. These features aim to encourage low speeds, more appropriate driving behaviour, provide pedestrian crossing opportunities, and provide a greater shared street environment for cycling. Traffic calming along Byron Avenue was previously approved as part of a wider area study for the McKellar Park community initiated in 2005. These measures had since prioritized for implementation through the Area Traffic Management Program. However, given the higher policy emphasis on cycling and pedestrian needs, the approved plan was updated through this study to align with current policies and address other localized concerns. Through the public consultation process, City Transportation Planning staff collected feedback primarily through an online questionnaire (posted to the City’s website between March 3, 2016 and May 25, 2016), but also by phone and email. A public meeting was held on June 16, 2016 to present the results of the questionnaire, the working draft concept plan, and solicit public feedback. In addition to the questionnaire, two Public Advisory Committee (PAC) meetings were held consisting of representatives from local community associations (McKellar Park, Westboro, Hampton-Iona, and Island Park), Ecology Ottawa, Citizens for Safe Cycling, Ottawa EcoDistrict, and Green Communities Canada. Representatives from local Business Improvement Associations (Westboro and West Wellington) were also consulted. For more information on the consultation results, please review the “As We Heard It” report (previously circulated to the public mailing list and posted to the City’s website). Would you like to participate in a 5-7 minute web experience survey to help us improve the City Hall section of ottawa.ca? We ask that you fill in the survey after you have finished your visit to this site. Even if you only spend a brief time on the site, we would like to hear from you.